When I first moved to Chicago, there was this girl who had the BEST hair. Every time I saw her, I complimented her on it. The first time I did I immediately asked her where she got her hair cut- she said Art & Science in Wicker Park. The second time I saw her I was like, again your hair is amazing, tell me what shampoo do you use. You are never going to guess what she uses. 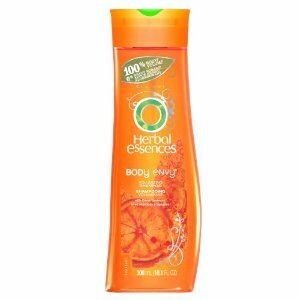 She uses Herbal Essences Body Envy Volumizing Shampoo. That stuff costs $4 bucks, less than my morning latte. Amazing. Obviously I made a B line to the drug store and picked up this high school haircare staple. Well. I was pretty impressed. It did not make my hair crazy voluminous or anything, but it did not dry it out either. When my hair air dried it looked pretty amazing, though nobody asked me about it or anything, but I definitely noticed a difference.